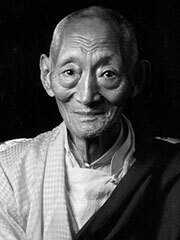 Kyabje Dorje Chang Kalu Rinpoche, usually called Kalu Rinpoche (1905 — May 10, 1989) was a Buddhist meditation master, scholar and teacher. He was one of the first Tibetan masters to teach in the West. The term Rinpoche is an honorific title (meaning «precious one» or «precious jewel») which is frequently used to address or describe reincarnated Tibetan lamas. Kalu is rarely referred to without this title. Kyabje Dorje Chang Kalu Rinpoche was born in 1905 during the Female Wood Snake year of the Tibetan lunar calendar in the district of Treshö Gang chi Rawa in the Hor region of Kham, Eastern Tibet. When Kalu Rinpoche was fifteen years old, he was sent to begin his higher studies at the great monastery of Palpung, the foremost center of the Karma Kagyu school. He remained there for more than a decade, during which time he mastered the vast body of teaching that forms the philosophical basis of Buddhist practice and completed two three-year retreats. Rinpoche’s gurus included the foremost disciples of the supreme master of the Rimé or Eclectic Movement, Jamgon Kongtrul Lodro Thaye. Among them were the Fifteenth Gyalwa Karmapa, Khakhyap Dorje; Situ Pema Wangchuk Gyalpo, the abbot and foremost teacher of Palpung monastery; Zhechen Gyaltsab Byurme Namgyla, the great Nyingma master who was regarded as Mipham Rinpoche’s unequaled disciple; and the meditation master Drupon Norbu Dondrup, whose teaching had a profound impact on Kalu Rinpoche’s life. At the same time, his Dharma brethren included the foremost masters of his generation: Kongtrul Khyentse Ozer, Zhechen Kongrtrul Rinpoche, Jamyang Khyentse Choki Lodro, Dilgo Khyentse Rinpoche, and many others. At about the age of twenty five, Rinpoche left Palpung to pursue the life of a solitary yogi in the woods of the Khampa countryside. For nearly fifteen years, he strove to perfect his realization of all aspects to the teachings and he became renowned in the villages and among the nomads as a true representative of the Bodhisattva‘s path. Kalu Rinpoche returned to Palpung to receive final teachings from Drupon Norbu Dondrup, who entrusted him with the rare transmission of the teaching of the Shangpa Kagyu. At the order of Situ Rinpoche, he was appointed Vajra Master of the Great Meditation hall of Palpung Monastery, where for many years he continually gave empowerments and teachings. During the 1940’s, Kalu Rinpoche visited central Tibet with the party of Situ Rinpoche, and there he taught extensively. His disciples included the Reting Rinpoche, regent of Tibet during the infancy of the Fourteenth Dalai Lama. Returning to Kham, Kalu Rinpoche became the abbot of the meditation center associated with Palpung and the meditation teacher of the Sixteenth Gyalwa Karmapa. He remained in that position until the situation in Tibet forced him into exile in India. Kalu Rinpoche has taught extensively in the Americas and Europe, and during his three visits to the West he had founded teaching centers in over a dozen countries. June Campbell, a former Kagyu nun who acted as his translator during these journies, has written a critical account of a period of three years in which she she says she became his sexual consort. She considered the relationship to be abusive and said she was warned to keep it secret and to make no demands on him. In France, he has established the first retreat center ever to teach the traditional three-year retreats of the Shangpa and Karma Kagyu lineages to Western students. On request of Shoko Asahara, founder of Japan’s controversial Buddhist group Aum Shinrikyo, Kalu Rinpoche has lectured to his followers in a number of Japanese cities. At 3:00 P. M., Wednesday, May 10, 1989, Kyabje Kalu Rinpoche, passed away at his monastery in Sonada. On September 17, 1990 Rinpoche’s Tulku was born in Darjeeling, India to Lama Gyaltsen and his wife Drolkar. Lama Gyaltsen, the nephew of Kalu Rinpoche, had served since his youth as Rinpoche’s secretary. Chamgon Tai Situ Rinpoche officially recognized Kalu Rinpoche’s yangsi (young reincarnation) on March 25, 1992, explaining that he had received definite signs from Kalu Rinpoche himself. Situ Rinpoche sent a letter of recognition with Lama Gyaltsen to the Fourteenth Dalai Lama, who immediately confirmed the recognition. On February 28, 1993, Kalu Rinpoche Yangsi was enthroned at Samdrup Tarjayling. Chamgon Tai Situ Rinpoche and Goshir Gyaltsap Rinpoche presided over the ceremony, assisted by Kalu Rinpoche’s heart-son, Bokar Rinpoche. Situ Rinpoche performed the hair-cutting ceremony and bestowed on the young tulku the name Karma Ngedön Tenpay Gyaltsen —Victory Banner of the Teachings of the True Meaning. He is now known as the Third Kalu Rinpoche.